Rated voltage of provided AC servo drive is 220V AC single/three phase, rated current is 15A, which designed for 200W/400W servo motor and the motor number is ATO-SERVO-60SY200/ATO-SERVO-60SY400. High precision 200 watt servo motor, 220V AC single or three-phase input, rated torque of 0.64N.m, rated speed of 3000 rpm, 2,500 PPR incremental encoder/ absolute encoder attached. Highly reliable and low cost servo motor, manufacturer direct sale. 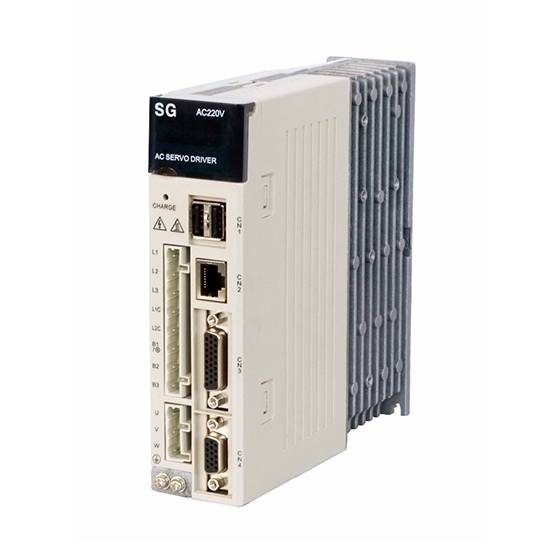 AC Servo Drive for 200W-400W Servo Motor offers superior high speed performance, high functionality and closed loop control. Application fields including CNC machining equipment, food processing machine, material conveying equipment, medical apparatus and instruments, textile machinery and so on. 2 Nameplate Indicates the SERVOPACK model and rating. 4 Charge Lights up when the main circuit power is turned on. Even if you turn OFF the main circuit power supply,this indicator will be lighting as long as the internal capacitor remains charged. Do not touch the main circuit or motor terminals while this indicator is lighting. Doing so may result in electric shocks. 5 Main Circuit Terminals The terminals depend on the main circuit power supply input specifications of the SERVOPACK. (U,V,W) The connection terminals for the servo motor main circuit cable (power line). 7 Ground Terminal The ground terminals to prevent electric shock. Always connect this terminal. 9 I/O Signal Connector (CN3) Connect to reference input signals and sequence I/O signals. 10 Encoder Connector (CN4) Rotary servo motor: Connect to the encoder in the servo motor. Linear servo motor: Connect to a serial converter unit or linear encoder. 11 Panel Display Used to display SERVOPACK status, alarm numbers, and parameters. 12 Panel Operation keys Used to set parameters. Due to the heating of electric devices in electrical control cabinet and thermal environment situation in cabinet, the temperature around servo driver will continue to rise. So considering about the configuration in the control cabinet and cooling of driver, it should be ensured that air temperature is under 50 degrees and relative humidity is under 90 percent. Long-term safe working temperature should be under 45 degrees. Whichever anti-vibration measure could be adopted to guarantee servo driver unaffected, and vibration to be under 0.5G. It strongly interferences the power wire and control wire of servo device when some jamming devices around the driver, which leads to wrong action of servo driver. A noise filter and any anti–interference method could be applied to assure driver working normally. Do pay attention to the increasing of leakage current after a noise filter added. To avoid this problem, an isolation transformer could be used. Take special notice: the control signal wire of servo driver is very susceptible to interference, therefor wiring and shielding protection should be reasonable.